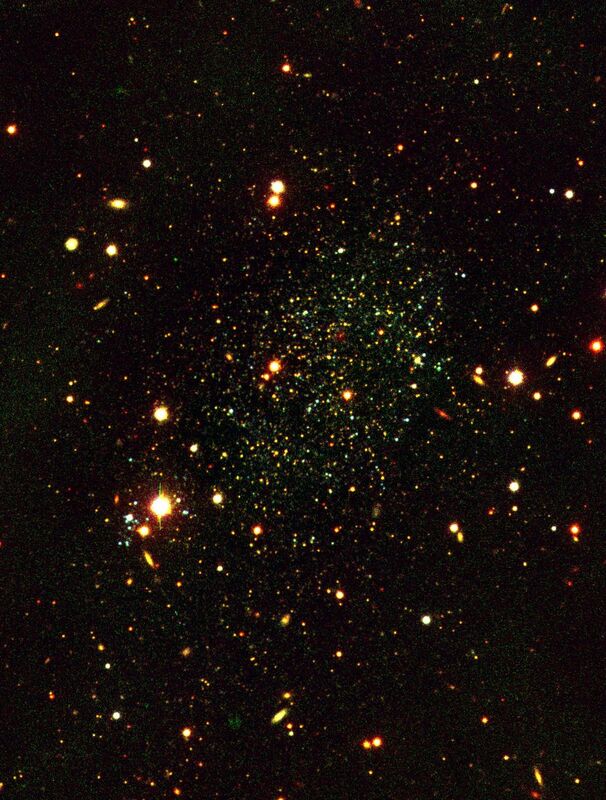 True-colour image of the dwarf galaxy Antlia combined from three exposures with the FORS1 multi-mode instrument at VLT UT1, in the B (blue), V (green) and R (red) optical bands. Many background galaxies are seen in the field. The total exposure times were 2400 sec, 2400 sec and 5400 sec, respectively. The seeing varied between 0.5 and 0.7 arcsec. The field measures about 7 x 7 arcmin 2. North is up and East is left. Very high quality images of Antlia were obtained in different colours by FORS1 on VLT UT1 in the period 27 - 31 January 1999. These data were taken around full moon, so they do not show as faint stars as they would under normal FORS operating conditions, but the image quality is exceptional. They represent by far the best images ever obtained of this galaxy, and they include the first deep B-band images.